With access to some of the country’s best venues for rock climbing, road and mountain biking, hiking and more, New Hampshire’s White Mountains are the place to be this summer. Whether you’re looking for action packed adventure or a quiet, relaxing escape into nature, there’s definitely something for you here. 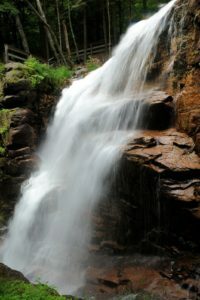 A perennial favorite summer activity in the White Mountains is exploring all of the waterfalls in this beautiful area. Come take a journey with us this summer, and find the best waterfalls in the White Mountains of New Hampshire. Book your room at our luxurious New Hampshire Bed and Breakfast today. It’s no secret that New Hampshire is home to some of the best waterfalls in the country. 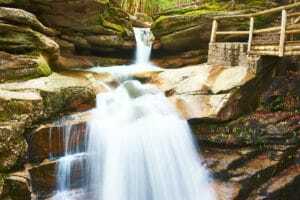 Some are easily accessible, including the popular Avalanche Falls in the Flume Gorge in nearby Franconia Notch State Park, but some are off the beaten path and require a bit of effort. The rewarding views are always worth the effort, though Though there are more waterfalls in the White Mountains than we can name here, you can’t go wrong with a visit to any one of these ten great falls near our Inn. One of the most popular and beautiful waterfalls in the White Mountains is Glen Ellis Falls. The waterfall drops at a slight (and unique) angle 64 feet into a stunning deep green pool. The Nancy Cascades are a truly beautiful sight to behold, and you can often find a much smaller crowd here than at the more popular waterfalls. The lower falls are 2.5 miles into the access trail, but it’s certainly worth a little more effort to get to the upper falls. Arethusa Falls is another of the famous and popular waterfalls in the White Mountains, and for good reason. At nearly 200 feet fall, it’s the tallest in New Hampshire and worth the 1.5 mile hike (one way) it takes to get there. The Upper Ammonoosuc Falls are beautiful, and there are several others in the area. None are particularly large, but they are still just as beautiful, and a wonderful place to snap a few photos. Many people have tried swimming in the swimming holes created here, but we don’t recommend it. The Falling Waters Trail in Franconia Notch State Park is certainly worth your time. It’s a popular trail to use to summit Haystack Mountain, but most importantly there are several waterfalls along the way. The best of them is Cloudland Falls at the end of the trail, which drops 80-foot in a horsetail fan. Franconia Falls is easy to access, as it’s located at the end of one of the flattest long-distance trails in the White Mountains. There are no big drops here, but plenty of rock slabs and pools, and even some natural waterslides when the water is running low. If you’re looking for a place to cool off on a hot day, Beede Falls is it. At the bottom of the main falls, you’ll find a large sandy pool that is relatively safe to swim in. Bridal Veil Falls is one of the most popular waterfalls to photograph in the White Mountains. The falls themselves plunge35-feet into a small pool below. Below that is a large waterslide over flat, polished granite. The Fall of Song waterfall on the Castle in the Clouds Property is worth a visit. The trails here offer access to several waterfalls, including Bridal Veil Falls, making it worth the trip. Just off the popular Kancamagus Highway, you’ll find another popular waterfall in New Hampshire; Sabbaday Falls. The trail leading to the 45-foot waterfall is accessible, and it’s a fairly easy journey to the viewing area. Enjoy a day exploring the incredible White Mountains, seeking some of the most beautiful waterfalls in the state of New Hampshire. When you’re done for the day, head back to the luxurious Sugar Hill Inn for a relaxing, romantic evening. Book your room at our Bed and Breakfast in the White Mountains today!